Do WER’s Apply To Doors? As the name suggests, Window Energy Ratings do not apply to doors. You can however get doors tested for energy efficiency, and this comes under DER's or Door energy Ratings. DER’s are not currently recognised by the building regulations and therefore only a minority of products have ever been tested. Perhaps this is because a fully glazed door will always be at least ‘A’ rated, while a front door with only a small amount of glazing will always be ‘G’ rated, due to the lack of solar gain, or perhaps the rules for Door Energy Ratings are yet to be put into stone by the Window Energy Rating Group. In truth we are not really sure. What we do know is that WERs are accepted as a method of compliancy to the building regulations, but DER's are not. Can I Specify ‘A’ Rated Glass For My Products? NO. The individual components of a window (i.e. Glass) cannot themselves have a Window Energy Rating. Window Energy Ratings are an overall value of the energy efficiency of a complete window. You cannot simply get a glass that is ‘A’ rated and put it in a product to achieve an overall ‘A’ rating. Different products may well need different glass specs in order to achieve an overall window energy rating of ‘A’. Are Windows With High WER's More Environmentally Friendly? YES. In theory windows with a high WER will help to reduce the amount of gas and electricity needed to heat your home, thus reduce carbon emissions. Window energy ratings do not however, take into consideration how green or environmentally friendly the manufacturing process is; only the energy efficiency of the final product (for this you look into BREEAM Ratings, BRE Environmental Assessment Methods). Nor does it take into consideration the sustainability of the building materials. Does An A Rated Window Have Better Security? The energy rating of a window, says nothing about the quality of manufacture, security, strength or weather performance, or even thermal efficiency of the window. It is simply a gage of the energy efficiency of the window, and how much energy it will save you. How Does A ‘C’ Rated window Compare? A ‘C’ rated window is the WER that is required to meet part L of the building regulations. A ‘C’ Rated window is still very energy efficient and could save you up to as much as £425 on your house hold bills (according to GGF). A window energy rating ‘C’ would be far more energy efficient than an ‘E’ rated window. But remember, there are two methods of compliance, Energy Efficiency (WER) and Thermal Efficiency (U value). An ‘E’ rated window could still meet the building regulations if it had a overall U value of 1.6W/M²K. Whereas a ‘C’ Rated window may only have a U value of 1.9W/M²K and just lots of solar gain. The lower the U value the less heat loss (the higher the thermal efficiency); the higher the g value the higher the solar heat gain (and higher the WER). Isn't Solar Gain, A Bad Thing? Solar gain is responsible for the heat you feel in rooms with a large glass area in the summer, such as conservatories and shop fronts. For years people have been trying to reduce the amount of heat transfer from the sun through glass using different glass coatings and matrials within the glass. So surely we don't want solar gain, isn’t solar gain a bad thing? The secret of a good window energy rating is to get as much solar gain through your windows as possible. Research has shown that solar gain in the average residential property will in fact, provide so called “Free Energy”. By specifying glass with high solar gain your windows can actually bring more heat into your home, than is lost. This means that on a cold day, if it is sunny out, your windows could theoretically heat your home for free. For applications, with a large glass area, where you wish to minimise solar gain (for example a conservatory or office building) you may wish to specify solar control, anti-sun or other solar reflective glass. This will however, result in a poor Window Energy Rating. In these circumstances you will need to specify windows with a low U value, in order to comply with building regulations and keep the heat from escaping your home. Will Windows With A High WER Help Heat My Home In Winter? In the middle of winter when the weather is at it's coldest and there is no sign of the sun in the sky. A rated windows will probably not heat your home. The amount of heat gained from solar gain will be neglidgable against the amount of heat lost through your windows. This is where a low U value will come into its own. Are Products With A High Energy Rating, More Thermally Efficient? No, not necessarily. You need to be careful not to confuse energy efficiency with thermal efficiency. Just because a window has a better Window Energy Rating than another window does not mean that it is any more thermally efficient. Glass with a very good U value often has poor solar gain, since they are by nature poor conductors, this will in affect reduce your WER. For the a more accurate value for thermal efficiency, you should always ask about the overall U value of the window, not just the centre pane U value of the glass. The lower the U value (thermal transmittance) the less heat loss through your windows and better the thermal efficiency. As a rough guide the average fully insulated cavity wall will have a U value of around 0.3 W/M²K, you want to get as close to this as possible. Industry standard double glazed units have a centre pane U value of 1.2 W/M²K, where as an average window system will have an overall U value of around 1.6 W/M²K in order to comply with the Building Regulations. Do Window Energy Ratings provide a measurement for energy performance? The WER is designed to allow consumers and specifiers to compare competing products using a simple and easy to understand ranking and labeling system. A WER Rating does NOT provide an absolute measure of the energy performance of a specific window or application. For this reason there is no guarantee that a window with a high WER will save you any money on you heating bills. Why is double glazing preferable to triple glazing? Triple glazed sealed units are made up of three rather than two pieces of glass and can achieve U values as low as 0.9 W/M2K when filled with just air and not argon. More glass on triple glazed units means more weight. Therefore you need thicker frames and heavier duty hardware to take the extra load, or smaller opening sashes. This can also make triple glazing quite expensive due to the extra glass and thicker frames required. Triple glazed units have excellent U values but it is more difficult to get a good WER as the extra pane of glass reduces visible light and the solar gain or G value. How Are Window Energy Ratings Calculated? 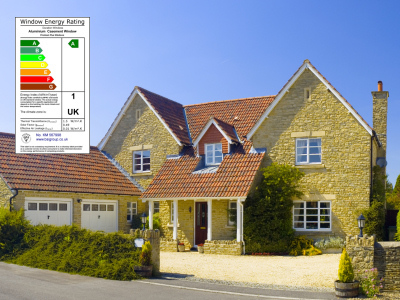 Window Energy Ratings provide the annual energy balance for a window and are calculated by taking the annual heat loss through a standardised window and offsetting it by the annual solar gain through the window (kWh/m²Year). You must first calculate the overall U value of a window (at an industry standard size). To do this you need to calculate the sum of the area weighted heat loss though the window frame, glass and glass edge or spacerbar. The U values for each component that makes up the window. The Air leakage and solar gain must then be calculated. Where AL (or air leakage) though the window in m³/h.m² at 50Pa pressure difference. The solar gain of the window is then calculated from the g value of the glass multiplied by the visible area of glazing (or glass minus the window frame). From the U value and air leakage you can work out the amount of heat that is lost through the window per year, this figure is then take away heat gained through solar gain. If the result is 0 or positive your window is ‘A’ rated. If the result is between 0 and -10 then the window is ‘B’ rated. If the result is between -10 and -20 then your window is ‘C’ rated. Therefore the difference between getting an ‘A’ rated and a ‘B’ rated window could be as little as 1 kWh/m² per Year or 0.019kWh/m² per week.